We identified a problem. We looked outside our industry for a solution. It looks high-tech but is actually low-tech analog. You might be tempted to do this too. If you did, you very well maybe throwing your money down the toilet. Jim Collins’ Good to Great is used by many companies today for obvious reasons. Its a compelling premise … what do these companies have in common that went from good to great? When it comes to the secret service radios I’ve seen facilities throw money down the toilet as they hope for the internal and external momentum described in part 1 from the radios without going through a Hedgehog type conversion BEFORE bringing in the new technology. BEFORE introducing the ‘math’ or before dreaming of increased census or community buzz that can and has come from the secret service investment, you MUST wrestle together with your staff to identify your identity. Defining your culture and then drawing a line in the sand CULTURALLY speaking. That is the basis for the an enduring momentum to build and without it whatever ‘pop’ you experience from the technology will be short-lived and after 3 months your radios will be in a closet somewhere in your facility and you will curse my name. Let me start with this … I’m a bit of a technofile. I’m not always the early adopter but I’m an early follower and eager adopter once ‘version 2’ comes out whether that be a new mac, iphone, ipad, kindle, etc. I regularly hit Gizmodo and Wired. I like this stuff. A lot. Since entering long-term care profession this tech love has turned into a love-hate relationship. An example of why I love it. Them: 10. 20. 15. 25. Me: Ok. Let’s say about 15 times. Now, think about how long it takes you to find that person. Sometimes they’re right outside the door. Sometimes they’re in the middle of helping a patient and you need to find someone else. Sometimes they’re hiding in a quiet place to get their charting done. Sometimes they’re in the employee break room. How long on average does it take? Them: 3 min. 10 min. 5 min. 7 min. Etc. 25 hours of care givers time per day that is not used for care giving. When the nurses and CNAs see that math on the white board in front of them, jaws drop. DONs are disgusted. People shake their heads in frustration. How do you fix that? Here’s what we did … we noticed at luxury hotels, some restaurants, even at OfficeMax something they use to improve the speed of communication. 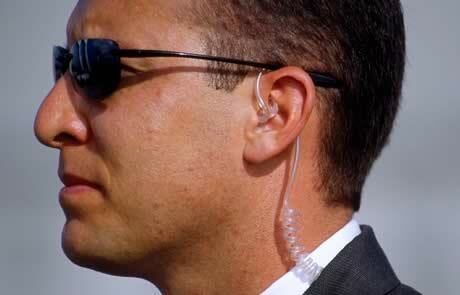 We called them Secret Service Radios. As I researched it, I found out that what looks pretty sophisticated with the sneaky ear piece, but in reality is very low-tech. You have a small 2-way radio that connects to a ear piece-microphone cable that you wear underneath your scrubs. My staff’s response was, for the most part, positive. * They welcomed a way to relieve the 25 hours/day pain that was no longer hidden. The impact both to our culture and to our care and to our census was significant. Culturally, the staff, families, and patients saw an outlay of money for one purpose with no financial ROI expected. That message is powerful. We’re spending this money to make your jobs better. To make care better. Period. I’ll explain in Part 2 of this topic why that is. *A couple of my CNAs doubted my motives. They thought I was trying to be big brother so I could always monitor exactly where they were at all times. So, just between themselves, they came up with a code word to alert each other when I was on the floor so they could look really busy. “7-11.” One of them would say, “7-11.” Others would repeat into their radios, “what?” with no reply. The code word was only meant for the other person who knew what it meant. Pretty hard for something like that to stay quiet. So, when I found out about it I invited one of them into my office. Me: Good. Everything going well? Me: Great. Hey, really quick … how did you come up with the code word 7-11? Him: (Deer in the headlights. Long pause.) I don’t know what you’re talking about. I spend a lot of time in ‘presenting mode.’ I typically use Apple’s Keynote product. There’s a lot of do’s and don’ts with slideshow presentations (powerpoint or keynote) that can make or break a presentation. But, today I stumbled upon a truly innovative way to present your message. The topic was slightly interesting to me, but I stayed glued to it to the end … B/C of how it’s presented. I wonder if there will be a cost-effective, efficient way for the layman (me) to tap into it? One of the biggest complaints in hospitals and nursing homes is how long it takes to get the help you need. A fanatical commitment to world class service is the right way to solve this symptom. AND, there’s a way to cut call light/wait time in half while improving morale between direct-care staff — join the secret service! Picture it … you’re a patient recovering from surgery. You are experiencing severe pain. You push your call light for the nurse. 3 minutes later, a nurse’s aide walks in and asks what you need. She tells you that she’ll go get the nurse for you. Unfortunately for the nurse aide and for you, the nurse is in her secret hiding spot in the facility where she can actually get some of her documentation done. The aide looks up and down the hall. No nurse. She goes to the med cart. No nurse. How is the aide feeling toward the nurse? More importantly, how are you feeling about the aide, the nurse, and the whole facility? – 16 staff in nursing x 20 searches for help x 5 minutes per search = 1,600 minutes/60 minutes = 27 hours. If you really want to pull your hair out, calculate the wage cost of that “looking for someone to help.” When I show this to Directors of Nursing, they have heart attacks. If your nursing staff/DNS is pushing back at all to the idea, do that math with them and you’ll see a change of heart. Just think of how much more care can be delivered if you had 54 hours/day more of nursing time available?! Externally … this has been HUGE for us in our community for marketing. The DC planners, doctors, vendors, etc. are thrilled that a SNF is so progressive/pro-active to this very common problem in healthcare. 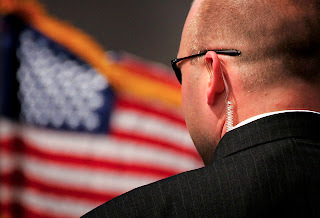 If you preach/market customer service as your distinguishing characteristic and are able to back it up with the secret service ear piece action … buzz, buzz, buzz. Post a comment/question or email me to find out more details about this solution. I have no vested interest in any technology solution provider by the way. I just can’t imagine delivering healthcare any other way anymore.